Rainbow Stars are gifts for both the person making and the person receiving. They are reminders of the blessings that can be found in the dark places, when love is present. They are inspired by our boy, and they now radiate throughout the world. When Benjamin was diagnosed with leukemia, we stared through the windows of Johns Hopkins All Children’s Hospital in St. Petersburg, Florida for countless hours, scared and confused. We brought our solar powered rainbow maker from home to stick onto the window. A family member also brought us a prism to catch the sunlight and bounce rainbows around our room. Slowly, we began to appreciate our blessings through a new and sharper lens. We appreciated each moment we shared with the people we love. We began to see the rainbows in the clouds. Inspired by the bright light our boy radiated, we are honored to send rainbows into the clouds of other families with children on treatment for cancer. 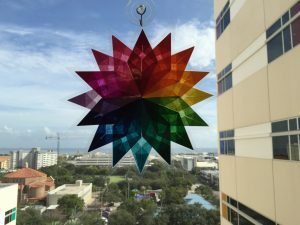 These 16 pointed stars are handmade with vibrant tissue paper and laminated with UV resistant plastic. Each comes with a suction cup, ready to adhere to any window. Our first delivery of stars went to All Children’s on the one year anniversary of Benjamin’s diagnosis. Word of the project has spread, and schools and service groups are helping us create these gifts of love. Now the stars brighten hundreds of children’s windows in most states, and several countries. If you would like to send a rainbow into the clouds of a child with cancer, please complete the form below. Be sure to include the child’s full name, mailing address, and diagnosis. We will be honored to send them a star. And if you would like to request kits for you or your service group to make stars, you may use the form below to do so. Tutorials are available for download HERE. Thank you! Would you like to help send Rainbow Stars to children with cancer? A donation of $5 will cover the supplies and shipping for one star shipped within the continental United States. Please contact us for current needs, a mailing address, or more information. Thank you!